Moore: Sitting here in this red car helps me understand how you feel when you’ve been hurt in a car wreck. How are you gonna pay for all this? Brown: You want the insurance company to pay. They seldom want to. Moore: Who’s gonna pay your doctor bills, your lost wages, and your pain and suffering? Brown: We’re attorney’s Brown and Moore. Moore: We work for you to make them pay. Brown: Often we can get you more money than they’re willing to tell you about. 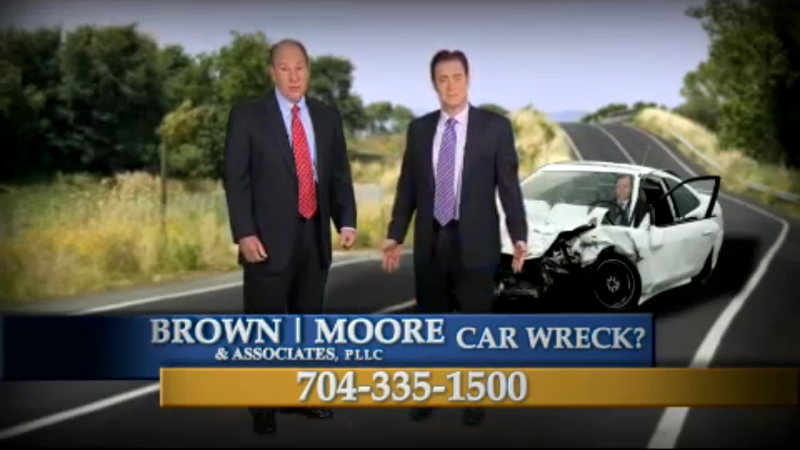 Moore: Hurt in car wreck? Don’t just sit there. Brown: Call the good guys, attorneys Brown and Moore.